Graham Nicholls is an author, artist and expert on out-of-body experiences (OBEs), having experienced and researched them since 1987, as well as written two books on the subject. While he supports the existence of psychical phenomena, he takes a scientific perspective towards the area. In preparation for his appearance on the September 7 episode of Swedenborg and Life, “Modern Spiritual Experiences,” he shared details about his personal spiritual experiences and the parallels with the experiences that Swedenborg described. Graham Nicholls: I have had transformative spiritual experiences that set my life in different directions on several occasions. The first would be the vision I had as a child of no more than five or six years old. I saw a tall figure standing in the doorway of the apartment in which I grew up. The figure seemed to be standing on the threshold between this world and the next. I do not know who or what this being was, and I try to resist the natural human urge to explain things in the absence of certainty. But what I can say is this experience opened me to the idea of other levels to reality from the very beginning, I saw them as normal and became fascinated by the spiritual, scientific, and parapsychological areas. My first book, Avenues of the Human Spirit, opens with this experience. I also decided to abstain from alcohol and drugs at eleven years old, a commitment I have kept to this day, and I later became vegetarian and then vegan to remove violence and exploitation from my lifestyle. The second most transformative experience would be the events of 1999. I was teaching some of my methods to a small group (four others) when I entered an intense out-of-body experience. I found myself standing on a street in Soho, London, watching a bombing at a pub there. The emotions and intensity of the experience sent me back to my body, but I was still in a kind of void state. My friends had become concerned about my well-being and were trying to bring me around. Once they succeeded I related to them the things I had seen and my conviction that it was a vision of a future event. Five days after that experience, the bombing happened at the location exactly where I had seen it in the OBE. You can see me and one of the witnesses talking about it here (this brings to mind Swedenborg’s fire experience you mention below, which was another thing that drew me to his works). Probably the most important experience leading to my current work was the event you mention in Sardinia. Due to a series of “unfortunate” events I was left with very little money, although I had traveled there to celebrate my birthday. I decided to focus on my meditation practice instead of doing the usual holiday things. During that process of intense meditation I experienced a shift in my awareness. It wasn’t dramatic or full of imagery or symbolism, it was a subtle yet deeply profound shift in awareness that changed my life. It’s very hard to put into words, but it resulted in me focusing more on humanitarian issues, and I set up a group to work against poverty in 2004 and became vegan in 2005, as I mentioned, to be more compassionate. SF: Swedenborg indicates that a strong awareness of our physical bodies and a preoccupation with external concerns impede our ability to be aware of the spiritual levels of ourselves and the spiritual realm. Can you speak to your experience with that (such as, how shutting down the outer senses opens up inner senses), and give some examples of experiences or methods for opening up higher awareness and leaving your body? GN: The process of shutting down the senses, or overwhelming them, has been at the core of virtually every spiritual practice throughout time. Meditation draws upon solitude and silent to bring the inner world to the fore. Letting go of body awareness can be an avenue to the out-of-body experience, as Swedenborg seemed to realize. Shamanism often uses sound and movement. And in many cultures pain, sensory deprivation, and austerities are common methods for reaching beyond ordinary consciousness. All in all, my view is that the body should be nurtured and developed in harmony with all other aspects of who we are, like the Monists I see no division or need to focus on one more than another, but consciousness seems to be much more than what we imagine, and we need to bypass the limits of the body to experience that. SF: Some people have spiritual awareness while they are children and lose it as they grow older. And yet you were able to maintain an ability for OBEs and spiritual awareness into adulthood. What do you attribute that to? GN: I met my first mentor, a Theosophist or esoteric philosopher named Dr. Douglas Baker, at the age of fifteen. He seemed to see potential in me from the beginning and gave me a weekend job helping him at his various spiritual lectures around London. Spirituality and science became my passions, and I never lost interest in these areas. My childhood heroes were people like Leonardo Da Vinci, so art infused with energy and mysticism was also a passion. Then at the age of about twenty I joined a group of spiritual practitioners focused on a more progressive form of spirituality combining science and personal practice. So I guess there was never a time I was away from these areas both in my private life and in my social life. GN: My comment about breathing was based on the observations of others while I am in the OBE state. I don’t have much awareness of it myself, other than in the early stages of trance when breathing seems to alter the way energy moves. This seems very in line with Yogic breathing, Pranayama for example, or the process of Taoist reverse breathing, which is believed to generate “chi.” It’s interesting that Swedenborg associates angels with processes of the body in this passage. I have often wondered if angels could be processes of nature. For example, the fact that the meaning of the names of angels—Gabriel, Michael, Rafael, Uriel etc.—relate to the elements of water, fire, air, and water is very revealing to me. SF: Swedenborg often mentioned that focusing on a certain topic of thought would either cause a spiritual being to appear to him, or would pull him to travel in spirit somewhere. You, also, seem to have traveled places out-of-body because you were thinking or wondering about it. Can you give examples of that? GN: Yes, this is well documented across the OBE/NDE [near-death experience] literature; where you place your attention will impact where you go. Consciousness is the driving force in these states. Your level of awareness as well as the things/places you think about are key. My experiences are full of these kinds of experiences. For example, in one recent experience I was thinking about London, as I sometimes miss it since I have now lived in Tallinn for six years. I suddenly found myself floating above one of the new buildings that has been constructed (the Shard) but interestingly I did not know they had built this building, so at first I was confused where I was. This is just an everyday example, but there are hundreds I could reference. What I would say, though, is the experiences where I just seem to be guided somewhere are the ones that are often the most profound and important. The ones to other levels like the afterlife are often like that. SF: Would you say most of your OBEs take you to other places in the physical world or universe, or most into an afterlife realm, or pretty equally both? GN: I would say more in the physical, and then maybe 30 or 40 percent to other levels. That is partly as one of the focuses within my work is to create a science of the OBE. Therefore, to gain greater understanding of the experience, I am trying to learn more about how vision and the other senses work in the out-of-body state. I want to explore what this other body is made of, or if it’s even a body at all. I have lots of questions that are best answered by working more within the objective world, as experiments can be conducted that way. SF: You gave a good description in your first interview with Curtis of a “misty” sort of afterlife place, where there was mostly just light around you and not much else to see. And you also mentioned that you have been to “summerland” realms. Can you give an example of a “summerland” experience, and what you saw there? (Swedenborg described beautiful and amazing landscapes in the spiritual realm.) Have you seen scenery that could also exist on earth (but more beautiful), or are there sometimes things you see that don’t exist on earth? GN: I have been to “summerland” realms more than any other afterlife level, I would say. I remember one of the first times I went to this kind of level when I was quite stressed, something had happened in my life and I was hurting. I laid down to relax and felt myself begin to become more heightened (one of the stages of the OBE). So I focused on it and felt myself lift out of my body and into a vast lush green valley edged by forest. I floated across the valley and over the first area of trees and into a smaller opening of trees. I descended into this private grove, and rested there, just taking in the warmth of the sun and the crystalline light all around me. I haven’t seen many people or beings in these areas, but in some of the other experiences I have seen beings characterized by rich colored forms, like they are pure energy or auras. I have attached an image of the earliest drawing I have of my own body in an experience and the color; I was about fourteen when I drew it (so excuse the poor artistic ability). SF: Can you comment on the frequency or method of different ways of ending up “out of body”—purposefully going into a trance, or focused thought on a destination, etc.? Do the OBE experiences ever happen spontaneously and unexpectedly? GN: My experiences do happen spontaneously, but mainly it’s a combination of feeling when the time is right and using a series of breathing and mental focus techniques. My second book, Navigating the Out-of-Body Experience, is focused on methods of having the experiences. As mentioned earlier, the main factor is letting go of awareness of the body, which requires deep relaxation or trance. SF: Swedenborg describes light in the afterlife realms as much brighter and different than earthly light. He describes many different kinds of light—golden, silvery, diamond-like, white, other colors, auras around people and things, etc. Do you have examples of different kinds of light you have seen in your OBEs? GN: I would agree with all of those listed. I have even used the same words in my diaries. I often refer to the crystalline state, for example, when light or perception (this light could also be our state of awareness) is at its most vivid and precise. I also sometimes see things as auric forms and colors, much like how a heat-sensitive camera looks. GN: I think you are referring to my first induced OBE. In that experience I had a definite feeling of a body made of blue/green energy. I saw my physical body, but yes, it was like looking at a photograph. I could see it was me, but it didn’t feel like the seat of my consciousness. However, over time the sense of an energy body has diminished, and now I rarely see or feel one. I tend to feel that the soul or spirit is not a set or particular form, but is some fundamental consciousness, maybe. The idea that we have another body inside us like a shell would seem the obvious conclusion, but I feel we need to look beyond that with our current scientific knowledge. 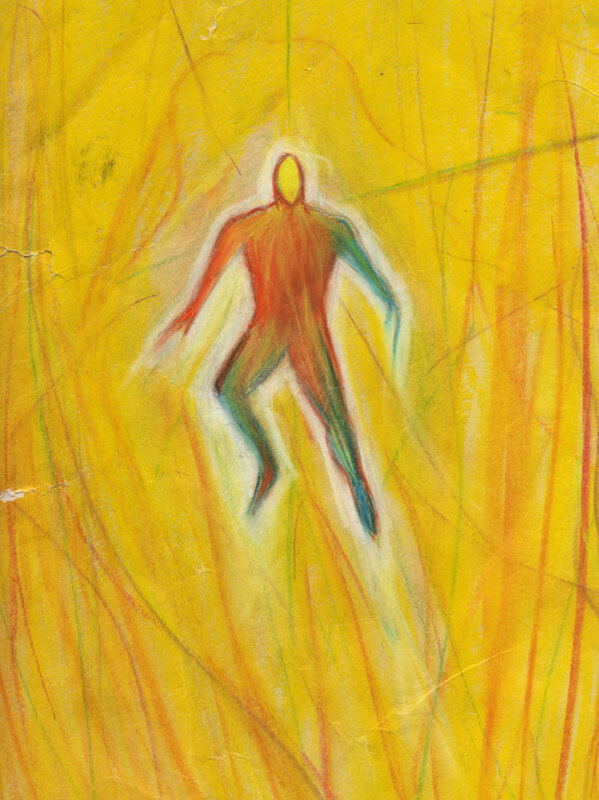 In my book Navigating the Out of Body Experience, I explore the energy body and the extended consciousness theories. SF: Swedenborg wrote of witnessing people who had recently died and crossed over to the afterlife, and were at first confused about where they were and what had happened. Also, Swedenborg often described how in the spiritual realm, we can feel each others’ feelings and experience each others’ experiences. Your story about the group of people who died all at once on that airplane crash touches on both of those phenomena. Do you have other examples? GN: I have encountered beings who may have been dead but were not aware, but it is hard to know for sure what they were. For example, a young woman came up alongside me in one experience in London. We communicated mind to mind, as is always the case in my experience of OBEs. She could have also been having an OBE, but I suspect she had passed, but had not fully realized it. In another experience I was in a summerland realm and there were a few figures all full with auric energy, rich blues and oranges, I think. I was able to communicate with them, but they seemed almost in a dream state; they were not fully aware. GN: Well, I have always been fascinated by space and planets, etc. My OBEs have not been to space on many occasions, but the ones that have were very powerful. The most recent was to one of the moons of Saturn. I was able to identify it via distinctive factors like a ridge through the center and also discoloration to the far side. In one of my early experiences I was also able to see what seemed to be plant life on a distant planet (never anything more advanced, though). I have not seen spiritual realms around the planets. SF: Will you describe your experience with coming in contact with “the core, as a fountain of energy and light”? I opened my eyes to a gleaming expanse of colour and light. The most beautiful imagery revealed itself in geometric streams of light and pattern, a sunset overflowing with rich turquoise and edged by delicate pink transformed into dancing rays like the charged particles of the northern lights. In every direction a new vision of natural beauty arose. As I looked deeper into the expanse I became aware that these colours and mists of energy were the result of consciousness all around me, like I was floating in a collective mind. In each moment I became more aware of exquisite points of light mixed within waves of colour and space. I felt that I could reach out and connect with anyone, anywhere. From the centre of the expanse rose a vast concentration of light; it was the source of all that was flowing around and it seemed to be drawing me closer to it. I felt like I was surrendering to the desire to connect with this endless sea of thought. As I touched the column of energy I rose up in a spiral of consciousness like I could think with a million minds at once. As if I was present in places all across the globe, all the emotions that characterise humanity phased in before dissolving away again. In that single moment I was consumed by the sense of endless interconnected minds. I saw the intricate lives of people across vast distances; I felt in the most tangible way the common humanity between people. No self, no separation, no now and no tomorrow. That was how I felt; accepted and totally free. 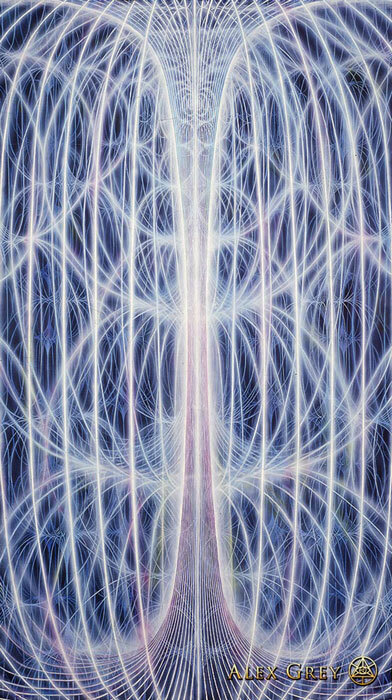 It looked very much like the painting by artist Alex Grey [referenced above].